The 27 March 2014 open session of the Carleton Board of Governors was a fascinating 3.5-hour session dominated by the perennial discussion of tuition increases. I will leave discussion of two other topics (strategic mandate and board representation) for a separate blog post. Before going into details about tuition increases, I want to thank all parties involved. The students who instigated the tuition debate were amazing. Their spokesperson on the board gave a remarkably well thought-out and impassioned plea. Student guests at the meeting were great, approximately eight of them in the boardroom and two or three dozen outside the room in the hallway. The chair of the board was as good a moderator and facilitator as I have ever seen. He arranged for the overflow of guests to listen to the debate by keeping the door open, with a special constable or two positioned at the doorway. More about the chair of the board in a second, but I need to first say a word about the special constables. Of course, the special constables were managers in our department of security because of the three-week-old OPSEU strike. But the special constables in attendance were amazing. They were calm, almost stoic. They allowed a few student guests to gradually partly ease into the boardroom doorway. They tolerated occasional applause and rallying cheers. They allowed board members to easily get into and out of the boardroom. Carleton’s security unit as a whole – not just the management, but also striking workers – has matured into an amazing group. Too bad that most of them are still on strike, after almost three weeks. And too bad the board would not allow any discussion of the ongoing OPSEU strike at the 27 March board meeting. Security officers are part of Carleton’s community and so should have been part of our conversation, even if we could not discuss collective agreements and their negotiations. Back to discussing the chair of the board. He not only allowed students to listen to the debate, but – more importantly – let the debate occur. A few board members, especially the university president tried to shut down debate on procedural grounds, but the chair was having no part of this. Furthermore, when one board member asked whether student representatives to the board would be allowed to vote on proposed tuition increases, the chair of the board unequivocally allowed for a free vote by all board members, including students. He justified this by invoking past practices. I applaud that decision, even if I think it was for a relatively weak reason. A few other “community” members of the board also actively encouraged debate, imploring the student representatives to speak their minds. One of the community members even voted in favour of a failed procedural motion to have the students’ motion of tuition freezes considered before the administration’s motion to raise tuition. Kudos. The debate on tuition increases was largely predictable. Students are against the increase. Administrators are for as large of a tuition increase as the province will allow. Community members on the board were willing to side with the administration, often quietly so. Most debaters were polite, with only a little bit of sniping, e.g. one community members said that faculty members would be hypocrites for voting for a tuition freeze while also asking for a salary increase. Arguments were usually eloquent by both sides, but predictable. There were, however, a few interesting nuances in the debate. Those in favour of tuition increases presented averages across people (students and employees). Those in favour of a tuition freeze presented variances across people. When you run a university like a for-profit business, averages across people are what matter. When you are a student or employee in a population with variance, your specific situation matters most. The dichotomy was particularly evident in the discussion about the provincial tuition fee rebate (“non-repayable award”) for students whose families make less than $160,000 per year. The administration focused on what percentage of students are eligible for this rebate, whereas the students focused on who actually gets these rebates. Apparently the rules have recently changed enough that many eligible students do not apply or do so incorrectly. Clearly our student cannot be distilled down to numbers, let alone average numbers. A community member of the board brought up closing of programs at a time when Carleton happens to be involuntarily closing a program, integrated science. Keeping that program open would partly compensate for revenue losses had a tuition freeze been approved. The provost incorrectly stated to the board that a new program, health sciences, would absorb all the students who would otherwise enroll in integrated science and that this was the reason for the involuntary closure. Health science had always been a large part (a “concentration”) of integrated science, but was never the whole integrated science program. The truth is that integrated science is being closed because its director did not complete some quality assurance paperwork and the dean did not take the lead to find somebody else to do this essential task. The Board should read the materials for the 28 March 2014 Senate meeting (the so-called “Senate Binder”) for details about involuntary closure of integrated science and therefore how the Board was misled. While keeping integrated science open would not generate the $9.2 million that would be lost by a tuition freeze, it shows that there are ways to bring in revenues without overburdening students. I also note the hypocrisy of closing a quintessentially interdisciplinary program, integrated science, when we are trying to promote interdisciplinarity at Carleton. There were a few other antithetical things said. While Carleton’s vice president finance gave the best presentation that I have seen him give, he occasionally stumbled, as we all do. For instance, he cherry-picked when comparing time histories of our revenues of first-year BA/BSc students with expenses of salaries. The cherry-picking was only showing faculty salaries, which he later had to admit were only half of university salaries and that faculty salaries have grown quicker than that of other employees. He also uttered the following cringe-worthy sentence, which I quote verbatim, “A 3% tuition increase is needed to improve the student experience.” While I understand how he might have arrived at that conclusion, the optics seemed wrong. While Carleton will be raising tuition by as much as they legally can, two possibly positive alternative outcomes arose from this meeting, The students made a motion to have the board co-sign a letter to the premier about post-secondary funding, especially tuition. That motion was amended to have such a letter go to the leaders of all three major provincial parties, which is sensible given current prospects of a new government. The problem was that the letter does not yet exist. To my mind, that made the motion moot insofar as all possible signatories will have to again agree to sign the final draft of such a letter. The other interesting outcome was to try to preclude another long-debate over tuition in subsequent years by candidly investigating financial tacks other than just raising tuition. The students said that items like the new parking garage should be on the table. The administration said that parking garages pay for themselves. I agree with the students on this one. The $9 million cost over-run for the garage will be paid for with parking fees. But the original cost of $25 million is being paid for by a mortgage. This is $25 million dollars that we could have used for other things, such as dealing with the pension fund. The board will strike a committee to investigate such alternative financial strategies, largely run out of the finance committee, but with additional representation from students. One other forward-looking item was to find a larger room for board meetings when guests are expected. The university offers sufficiently few evening classes that the board could probably reserve a back-up room for every Thursday evening at 4 pm. That way, even if the board is surprised by so-called ‘protesters’, we still would have a decent venue. Finally, I suggest that all members of the Carleton community attend March open sessions of the board at least once. This was a very informative discussion and downright civil. In a separate posting today, I wrote about the majority of the open session on 27 March 2014, i.e. about tuition increases. Here I want to discuss two other loose ends: strategic mandate agreements and board representation. The administration just announced the new boutique metrics that Carleton is proposing to the province for our evaluation, two of which surprised me. First, Carleton proposed that counting the number of external adjuncts will be beneficial to us. They justify this as showing collaboration outside of the university. They may be right, but additional adjuncts are also a cheap way to get research and teaching. The case could also be made that we appoint additional adjuncts in lieu of hiring additional faculty. The second new metric is average teaching evaluation scores. This is currently high, with a 3-year average of 4.47 out of 5, so close to the ceiling that it is likely that the average will decrease! There was also something totally disingenuous about the current 3-year average, namely that the questions asked on the teaching evaluation form changed last year. The 3-year average is mixing apples and oranges, but hopefully the province won’t notice that we are pulling such a dubious statistical trick. It is possible that those who wrote our strategic mandate agreement were unaware of this change in teaching evaluation questions because none of them teach. But that too is problematic. The good news is that teaching evaluation scores are positively correlated with course marks and the recent Ottawa Citizen analysis shows that we have modest grade inflation. So, if we can keep up that grade inflation, our average teaching evaluation scores should approach their asymptote. Carleton’s Board of Governors is typical for such organizations in that most substantive work is done in committees and that the most important committee work is done by the executive committee. This does not bode well for diversity of ideas because currently the chairs of all Carleton Board of Governors committees are male. Furthermore the executive “committee shall be composed of the Chancellor, the President, the Chair of the Board, the Vice-Chair of the Board, the Past-Chair, either the Chair or Vice-Chair of standing committees and two additional Community-at-large members to ensure representational views” (from terms of reference). Ensuring representational views is a superb notion. Yet the board’s executive committee has few women, no students, no staff, and no faculty. This sort of hypocrisy and gender bias cannot reflect well upon the reputation of a progressive university in the 21st century. For at least the past eight years, Carleton has been wantonly breaching the confidentiality of its students by requiring them to fill in final exam signing sheets, one of which is attached below. An invigilator walks around the room with these signing sheets thirty minutes after the start of each final exam. Each student has to write their name, ID number, and signature. The invigilator repeats this with each student until the signing sheet is filled with information for thirty students. Then additional signing sheets are used for additional students until all students have signed. The problem is that students get to see the name, ID number, and signature of all students who signed before them. The thirtieth student gets the confidential information of all twenty-nine students that preceded them. This makes a mockery of the rule (actually law in FIPPA) that renders students’ names and ID numbers private. I am not sure whether signatures are also supposed to be kept private. Since fall 2008, I have regularly raised this issue with the office of the dean of science and the associate vice president of finance & administration for institutional research and planning (OIRP). On some occasions, I copied in the provost and have also broached this matter with the chair of the board of governors. Each time, I was told that a fix was imminent, being told that OIRP and exam services would be purchasing ID card readers or that the assistant dean of science was working on a different card scanning system. After five years, none of these alternatives have materialized. Therefore information on ten of thousands of Carleton students’ identities has been knowingly compromised. Carleton has at least instituted a policy that instructors can request that each student receive and sign their own signing sheet. This would eliminate the breach of privacy issues if it were instituted in all classes or the option was given to all students. 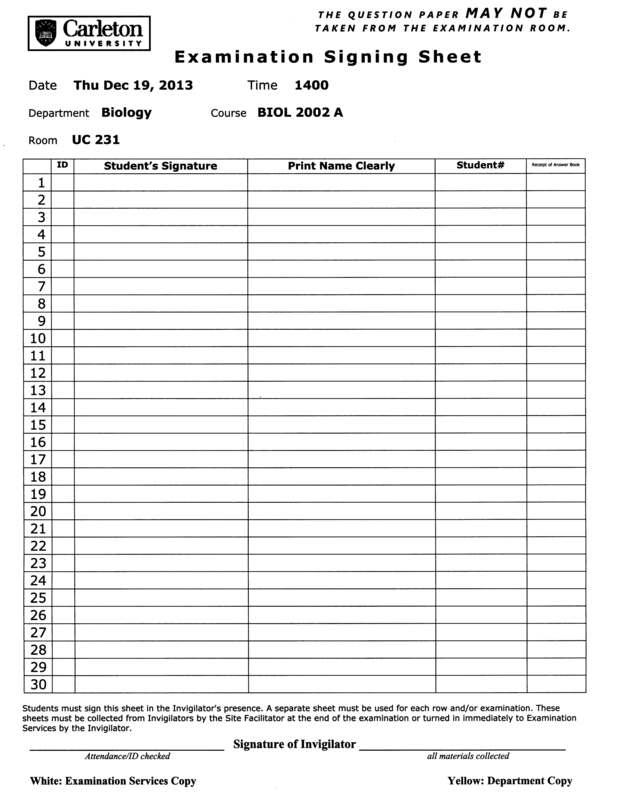 The problem is that only instructors (not students) are given this option of individual signing sheets. In December 2011 and December 2013, I queried Carleton’s office of legal counsel about this matter because they have cognizance over FIPPA matters. On 7 January 2014 Rob Moher replied that (somehow) the signing sheets are legal and do not breach privacy of students vis-à-vis FIPPA. Unfortunately, I cannot include their written decision in this blog because the decision was marked “privileged and confidential”. The Orwellian irony here is that student information is deemed to be neither privileged nor confidential in a written decision that is itself privileged and confidential (folks at CSEC, CSIS, GCHQ, NSA, CIA, and especially OLC would be proud). Carleton students deserve better. I have been trying to solve this problem quietly and internally for over five years, but to no avail. Therefore, today I am going public with this matter and ask for your help. Maybe together we can start restoring students’ confidentiality during the April 2014 final exam period. Thank you. Nick Falvo (here) and John Osborne (here) recently posted fascinating observations regarding university governance. Also see Nick’s accompanying powerpoint slides (here). Please pardon me while I use their excellent observations as a springboard, with identical postings to both my Senate and Board of Governors blogs. John Osborne lamented the boring (“sedate”) nature of Carleton’s Senate. This year Senate has become a showcase for mediocrity by featuring long presentations on things like purchasing furniture by the director of the so-called discovery centre and an amazing example of how not to teach by the head of the university’s teaching and learning unit (hint: the provost’s office looks inept when they try to show off). John Osborne’s ideas about changing the time of meetings and composition of senate membership are interesting. However, I would not want meetings that start at 7:30 pm because this puts undue hardship on women, who still do the majority of childcare in our society. There are other things we can do to make meetings more exciting and productive. We can liven things up by submitting questions for question period. See what happened by broaching DFW rates in question period? (scroll down to the DFW section on the 28 Feb 2014 Senate blog). Question period is a vehicle that lets all members of senate decide what is relevant. What about a discussion of revising the Carleton University Act, which specifies the roles of the board, senate, and president? If both the board and senate were to approve such changes, then probably so would the province, given that this is a private bill.